On August 18 @ noon CST, we launched the ability for members to export all of their blog entries to a single, compressed XML file. Its open nature will allow for the development of third-party import tools. Exporting your posts from ActiveRain has been a long awaited feature that is now available to all members. The format is XML and can be manipulated in many different ways which I’ll demonstrate in future posts. Special thanks to our tech team for making this possible. 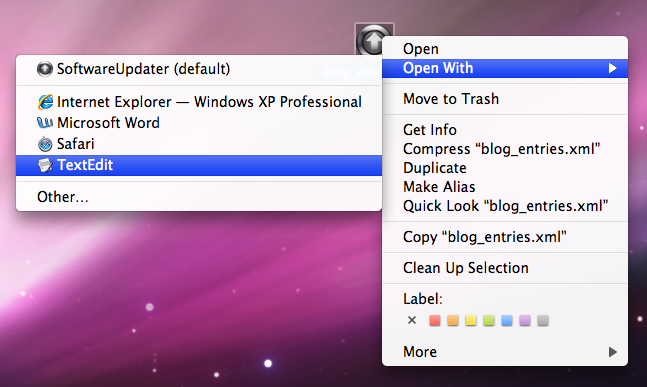 This new feature will allow you to backup and export your Blog posts with a single click. Note: Depending on what computer you are running (IE: Mac, PC) and what operating system, the next window that pops up may appear slightly different, but it will be the same principle. You are saving a file to a specified location on your computer. The pop-up window below will appear. Select “Save File” to your desktop, and click OK.
You will have a zipped or compressed file on your desktop containing the XML file with all your Blog entries. To open and view this file, or to use with any XML compatible formats and programs, right click your mouse on it and select the program you wish to open it in. For this example, I am going to use a simple text editor application on my computer called TEXT EDIT. 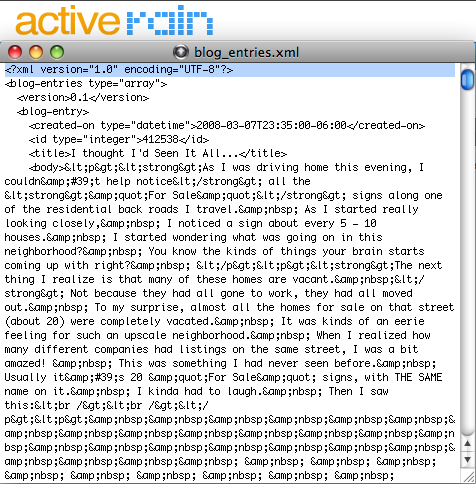 You can now see the XML format of your entire ActiveRain Blog. Now don’t go passing out on me (LOL~) understand that XML formats are a complex and more complicated format than most of us are used to working with or seeing, however, there will be a multitude of ways that this data can be used by other programs and sources. You cannot hurt your ActiveRain Blog by messing around and experimenting with this file. It is already exported from AR to your computer and will not affect your AR blog in any way. You have now successfully downloaded and backed up your entire ActiveRain Blog and every post in it. I’ll try and post some more advanced information on ways this can be used in the near future, but for now, at least you know how to access and download it to your computer. Baby steps, just baby steps before we show you how to run the 100 yard dash with it. I’m sure there will be many questions, and ideas generated by this post, so please feel free to leave your comments and thoughts. I’ll do my best to get your questions answered in an accurate and timely manner.